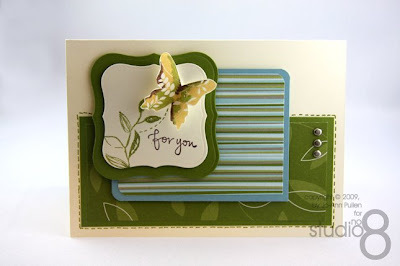 This card was inspired by Great Friend stamp set from Stampin Up. 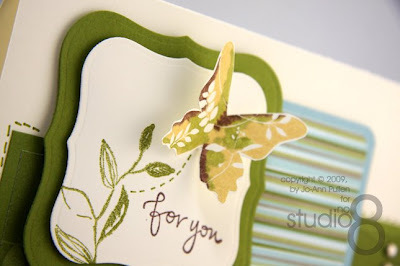 I love how the butterfly feels like it is flying out of the leaves and off the card. 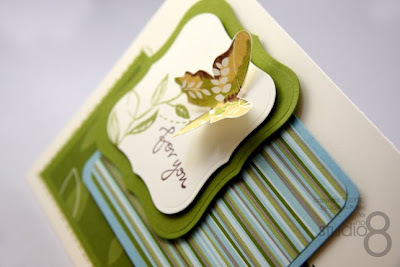 The Great Friend stamp set is part of the new Stampin Up Occasions Mini Catalogue which goes on sale April 1 to June 3o. This catalogue is packed full of fantastic stuff that will be hard to resist, well at least for me it was. Anyway here is my entry for Mojo Monday Week # 77. Enjoy! Now that I found your blog, you will be getting losts of comments from me because I love your work! so so pretty. and i love your butterfly.